We are excited to be participating and as a SUPER SPONSOR of 2017 Summer Coffee Lovers Blog Hop!! 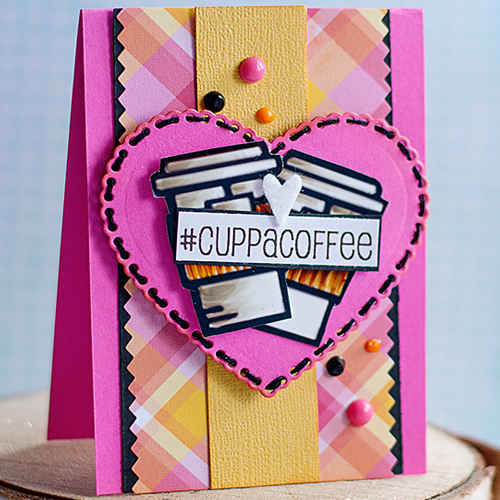 Coffee Lovers is a community of coffee-loving (or tea or cocoa) card makers. Visit the website that provides fresh brewed posts and seasonal flavored blog hops. 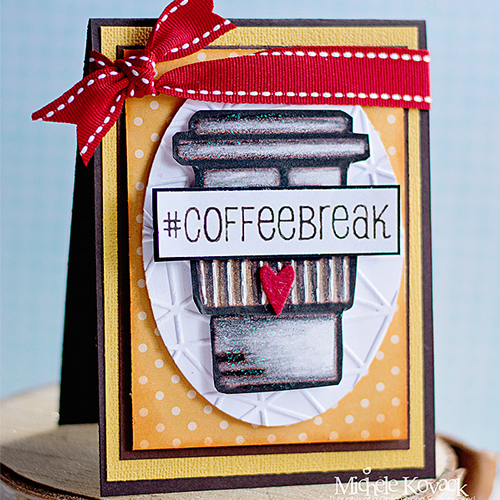 Today Michele Kovack shares her fun java themed projects just for the occasion! Hi guys! I couldn’t resist making TWO cards for today’s hop! As a total coffee addict, I can’t seem to start my day without it! My first card uses some fun coffee stamps on a stitched heart. My projects always have to have dimension, so I am equally addicted to Crafty Foam Tape! For the bottom layers with the plaid, yellow, and black paper, I used E-Z Squares® Refillable Dispenser. Super fast and easy to adhere everything! I wanted to add a little felt heart to the center, so I used Dodz Adhesive Dots Small. My next card uses a large coffee image that was colored with colored pencils. Sparkle and dimension between the layers was created with my faithful friend, Crafty Foam Tape. Next I added some coordinating patterned paper, a red bow, and a little red felt heart. The knot of the bow and the felt heart were secured using an Dodz Adhesive Dot Small. This entry was posted in Adhesive Dots & Lines, Cards, Crafty Foam Tape, E-Z Runner® Dispensers and tagged Adhesive Dots Small, Blog Hop, Coffee, Copic Marker, Crafty Foam Tape White, E-Z Runner and E-Z Squares Combo Value Pack, E-Z Squares, E-Z Squares Refillable, Lawn Fawn, Michele Kovack, Papertrey Ink, Prisma, SRM. Bookmark the permalink. 39 Responses to "2017 Summer Coffee Lovers Blog Hop!" Michele, you know that I absolutely LOVE your style…these are AMAZING!!!!!! Big thanks to Scrapbook Adhesives by 3L for being a Super Sponsor! Love both awesome card designs! These are simply wonderful! Love all your cute cards. Oh my, LOVE these! Gorgeous! I love all of those coffee theme cards. Thanks for being a super sponsor too. Fun cards! I love the plaid & the heart on the one. Love those fun pops of color. Thanks for being a super sponsor. What bright, fun coffee themed cards. Great creations for this blog hop. Thanks for sharing them and for being a sponsor, too. Great cards. I like the papers and the dimension. Both of your cards are just so awesome. I really like the glitter on the coffee cup! Thanks for being a sponsor. These are really beautiful. Love the layers being popped up. Gorgeous cards! Thanks for the inspiration! And thanks so much for being a sponsor! Michele,I love your fun style, so bright and colorful! I love the spelling of your name too! Beautiful, bright,bold designs that look amazing! Fantastic cards Michelle. Love the coffee images and the sparkle on the first one! The stitched heart is so sweet! Love, love, love it! Cute cards. Love the designs of each of them. Stunning dimension, color and layout of your cards! Beautiful! Beautiful cards! Thanks for the inspirations and being a Super Sponsor. The more, the merrier, Michele! 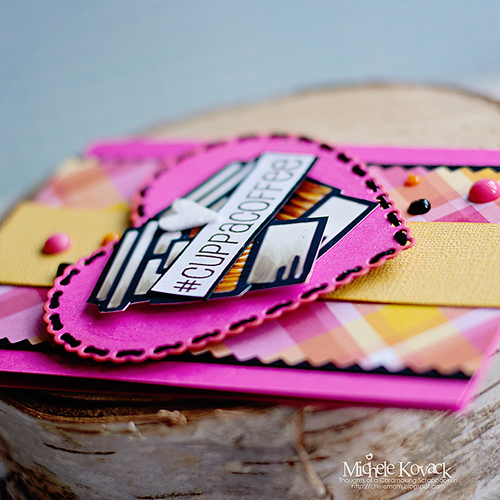 Love your cards and I love my crafty foam tape too! Love SBAby3L and so happy that they’re a wonderful sponsor. Great cards. Love the colors and accents of all the cards. The dimension is also great. Thanks for being a sponsor. Just love that little touch of glitter on the coffee cup. Thanks for sponsoring. Fun cards with awesome layering and details! I love the sparkles on that coool #coffeebreak cup! Thanks for sponsoring the hop! FAbulous coloring and card, Michele! And thank you Scrapbook Adhesives for being a super sponsor!! I love using your wonderful products! Love your designs on these fabulous cards! I love these cards! The subtle glitter is beautiful and I love the colors. Thanks for sharing! Thanks for sponsoring this hop! Your products are a must have! I love both the E-Z refillable runners and the EZ Grand Runner! Your cards are adorable! I love the layering and color choices! I am a sucker for adding ribbon to cards! Thanks for the inspiration and for the opportunity to win! 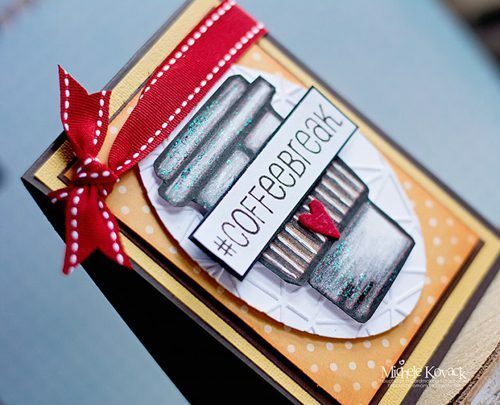 Really adorable coffee themed inspiration, Michele! Thanks so much for sponsoring the CLBH. Love your cards! The cups look amazing!